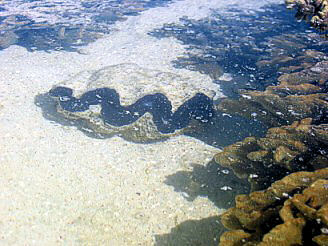 During the low tide much of the fringing reef is exposed to the sun and invites to a reef walk. Of course, it's not like having a snorkel, but still an interesting thing to do. Many animals went to deeper waters, some are caught in tidal pools and some can't escape at all. 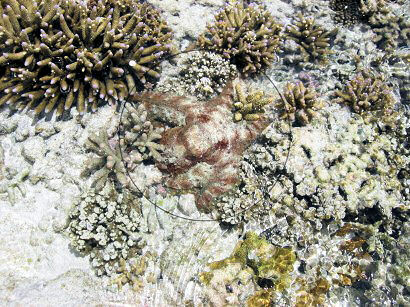 Quite a lot of these Tridacna shells can be found, so it doesn't harm them at all. This octopus found himself horrified by the vanishing water and some people walking along for the glass bottom boat. They can make themselves quite invisible. This specimen is about half-way to perfect color adaption, so I made a tiny circle around it. Seconds later one wouldn't have found it at all anymore. But there was no real danger for it: If required, they cay walk (walk?) a bit over dry areas.